Career and job are important and significant factors in one’s life. At graduation level, we always dream about a specific job, but not everyone gets the position of their dreams. Sometimes we need to compromise with our requirements, and we force ourselves to join the job that we hate. When you take such a responsibility and even if it satisfies your financial needs, you suffer a lot mentally. Let’s face it – when you hate your job, you regret taking the role, but at the same time you cannot leave it too. You sometimes get confused about what to do with this situation? What can be done to overcome regret and mental frustration? 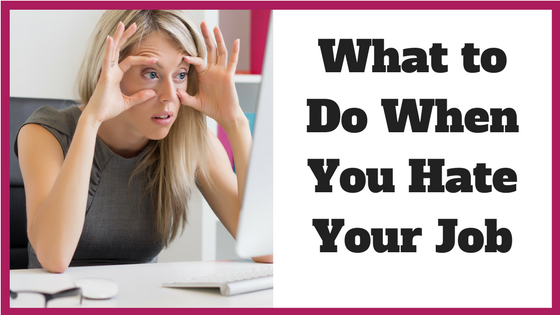 What to do when you hate your job? Here are the top 10 things to do when you hate your job. If you don’t like the work you do, then at least try to love your colleagues that work with you. That will make things quite bearable and easy to handle. Friendship is always special. If you make a great bond with your colleagues, then you won’t feel alone. They will make your day worth coming to the workplace. To mend the relationship better, plan some trips on the weekend with them, organize after-work parties and make lunches together. Having good friends around you can make the environment in office soothing, and you won’t feel the pressure of your work. This will help you to distract yourself from regrets. Friends in the office can also help you in solving huddles or problems that you are facing in office. They also boost up your morale which in turn help you to perform well in your job. Keeping a positive attitude in such situations is very needful. When you hate your job, you do many things forcefully. It has a significant impact on your mental as well as physical status. You may look and feel tired. If you keep a positive attitude throughout like “In the end, I am getting paid,” “It’s just a phase,” “I am not the only one,” “I will get over it,” you may feel better. Look at the positive side of the job until you find out the valid reasons to quit the job. Don’t just make excuses like extra workload and non-supportive colleagues. If your work is tedious, then talk to your boss or supervisor for new projects. Your boss or supervisor must know about the problems; you are facing during the project. Always remember not to complain about old projects when you are trying to get a new project. If you use proper statistics and analysis while talking, you may get the projects that interest you. Sometimes the field you are in may not interest you, but other departments in your organization may make you love your job. Look for such opportunities in your organization, where you can find your interest. Try to apply in the different department which is of your importance and slowly and gradually move in that department. When you hate your job, it is quite tricky to follow deadlines and other things. That causes more trouble in liking your post. Therefore, always avoid procrastinating as that may lead to overload which consequently will lead to the disliking the job. Always plan your day and work responsibilities. Set the goals for the ongoing project. “Think wisely before you act” is a common phrase which everyone should follow in their lives.Quitting job immediately after you realize you hate the situation is quite rubbish. It might be a phase. You should wait and do self-assessments. Note down the pros and cons of the job you are doing. Think about the time when you joined this job and note down your needs and expectations of that time. Quitting jobs will be unprofessional, and it will be like giving up. So, analyze and then take a decision. While doing the job that you hate, always focus on nurturing your hobbies and love in your free time. You never know when any money-oriented opportunity may knock out of your hobbies. There are plenty of people who have left their jobs to follow their passions. Even you can do that, but you need to make a proper plan to do it. Therefore, whenever you are free, find out the ways to make money out of your passion. Even if you are thinking of quitting the job, be professional while doing the procedure. Mind your words and actions when you are trying to leave the job. Before initiating the idea, do the proper planning of what you are going to present in front of your boss. Start job hunting but keep your lips sealed when doing it. Keeping a positive attitude on, you need to analyze the elements that make you unhappy with your job. Write them down and see which factors can make you miserable with and how can these factors be eliminated with proper solutions. If the elements that make you unhappy are more in quantity than the happy factors and no solutions are available to reduce the unhappy factors, then you can think of quitting the job. But proper analysis should be done. Don’t add silly excuses into the list of elements. It is the first thought that comes to your mind when you start hating your job. If you still hate your job, even trying all the above tactics, then it is better you leave that job. You must follow the procedures while resigning. Give the proper notice to your organization instead of just disappearing. Complete your ongoing projects and handover responsibilities with appropriate instructions and documentation. Job, being an essential part of one’s life has to be exciting and beneficial to that person in all aspects. Changing a job for financial benefits and profile building is another thing, but if you hate your job and after trying everything you still hate it, then you must change it because as an adult you give almost more than half of your day to your work. You can think of turning your passion into your job. That may not give you a tremendous amount of money, but it will keep you happy as you are doing what interests you. Always do what you love as that is important for better mental health, but you need to look at some possible factors too. You should be getting the pay which will help to pay your bills. Quitting a job can be depressing so before doing it, hunt for the suitable job profiles and try to contact them. Make sure the factors made you unhappy in your job are not there in a new position; otherwise there will be no use of joining another post.